I was in Columbus last week, and while I was there I was able to sit down for an hour long conversation with Mayor Michael Coleman. We talked about Columbus’ economic out-performance relative to the rest of Ohio, its secret sauce as a city, how it can gain better brand recognition in the market, Rust Belt self-disparagement, the city’s bicentennial, the role of Ohio State, and whether the city needs to develop a signature claim to fame – plus more as well. 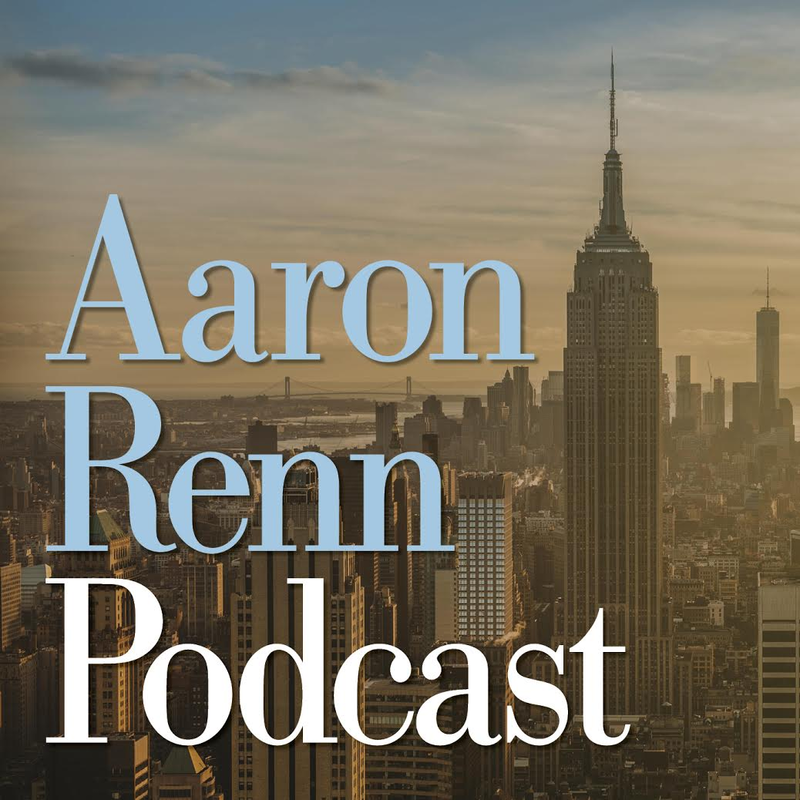 If the audio player below doesn’t display, click over to listen on Soundcloud. For those who prefer reading to listening, a complete transcript is available. Mayor Michael Coleman. Image via City of Columbus. Here are some edited highlights of our discussion. You can also read the complete transcript. I have nothing negative to say about any of the cities in Ohio. But the truth is that they’re part of the Rust Belt. And Columbus really isn’t. Columbus is an anomaly in the state of Ohio. While all of the other major cities in Ohio are decreasing in size and population, increased poverty, all those things that are representative of a Rust Belt city, Columbus is just the opposite. We have a tremendous amount of young people that have moved into our community. Our average age I think is somewhere around 33 or 34 years old. We have gone from a brain drain city to a brain magnet city. And economic growth has been incredible. We’ve had 40,000 new jobs in the past three years. And it’s a city that really is different from the rest of the state. And I think if you look at the state economy, there’s one major pillar in the state economy — and it’s the city of Columbus. Be progressive, a lot more progressive than what it is. The state legislature is a pretty conservative body. To some extent, they’re pro-business, but when you’re not pro anything else it frankly impacts the business development in a state. We’re very pro a lot of things in this city. We’re pro-business. I’m a pro-business Democrat. I believe in the creation of jobs and the quality of jobs. It’s part of what I do every day. 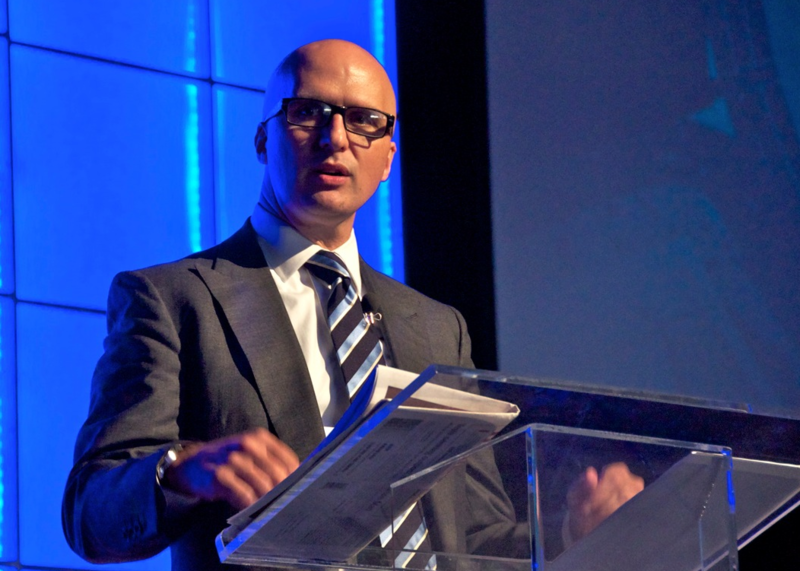 I view myself as the top economic development officer for the city of Columbus. So we’re very pro-business, pro-development. But we’re also pro other things. I’m pro-gay rights. I’m pro-reasonable, rational gun control. I’m pro-human rights and human dignity. You add that mix together, of good jobs with a good life, it really makes for a vibrant economy. We have a very smart population in Columbus, very bright, they’re very discerning. And they’ve not supported some tax increases. So our folks, they were able to discern as to what’s right for them and what’s wrong for them at that time. We recently lost a couple of tax increases. I’ll look back on it and say, “Hey, it makes sense. I get that. I understand why those lost.” This is the one that passed, and this is the one that made all the difference. We were at a point where we were going to have to lay off 500 police and firefighters. At that time we cut all kinds of things, like trash, leaf pickup, we closed recreation centers, we had significant layoffs, we had furloughs — we cut dramatically all over and everywhere. And the community said we want a quality of life. Those things are important to us. And once you cut safety, and crime becomes rampant in a community, you cannot come back for a long time. When the community isn’t safe, you can’t create jobs, you can’t have parks, you can’t have bike paths. None of those things can happen if the quality of life in the community is declined dramatically. So the community made a choice at that time to preserve the quality of life. And this made a difference. If we had had those cuts, if that income tax did not pass, you wouldn’t be sitting here today talking about the vibrancy of our city. You’d be talking about, what are you going to do about bringing the city back from the depression it’s in, the distress it’s in? And it would be like a lot of Midwestern cities that frankly are struggling, that are struggling beyond all measure. You can’t be pro-business and not be pro anything else. I’m pro-business — unabashedly. Good jobs, business expansion, it means all the difference in the community where income tax is the driver of services and your budget and the vibrancy of the community. But you have to think two sides of that coin. One side is development of jobs, the other side is development of place — quality. What are the amenities? What are the things that people want to have in their state or their community that enhance its viability and its vibrancy? You don’t need a slogan. You need experience. You want to relay an experience. And the hard thing about Columbus is there’s multiple, solid experiences in our city that are valid and meaningful to the 21st century. Again, fashion, who would have thought? Now a brain magnet city, who would have thought? The largest city in the state of Ohio — by far. The next largest city is less than half our size, Cleveland. Who would have thought? That’s why we work really hard on a multiple strategy approach. One of them is really going to hit, and you’ve got to just keep going. People are asking, “Why am I working hard to get Democratic or Republican convention in the City of Columbus? That’s just nothing but a hassle.” The reason is there’s this glass ceiling out there, and we’ve got to break through. We may or may not get a Democratic convention or a Republican convention, but to be considered, and to be viewed differently in the process, is important. I’ll be posting further thoughts on the Columbus brand over the weekend. I asked the mayor why people in Columbus persist in having a chip on their shoulder about being a “cow town” even though I’ve never heard anyone from outside Ohio use the term. Because the truth is, there are some folks in this community that at one point viewed ourselves as a cow town. And for me, that’s a dirty word. So I had a strategy that we executed, and it worked great. It was our bicentennial, 2012. In 2007 I pulled the community together. We had the largest town hall meeting in the history of the universe at the convention center. We had a couple thousand people. We brought a couple thousand of our residents into the convention hall and we spent time on what we want to do. I had a mission; my mission was to help change the mentality of how we view ourselves. Because you can’t market yourself until you view yourselves a certain way. So what I started talking about then and I still talk about today is, this city needs to continue with a sense of modesty, but not modesty to a fault. Because frankly, we should have a sense of what I call swagger. And I’ve written articles on it. I’ve written op-eds on it. We’ve done all kinds of stuff, speeches all over the city — is that this city needs to have a sense of swagger. Because we have so much to offer, so much we’ve accomplished, and we need to feel that when we go on that football field we can win. And we got to walk, we got to talk, we got to feel as if we have swagger. And I pushed it hard. And frankly, I think that effort has changed how we view ourselves. I think the early mayors’ focus was civil rights. The issues have changed over time. While civil rights continues to be important, people have an expectation that mayors deliver, mayors change the city for the better in every aspect of a community, from jobs, to housing, to streets, to police, to safety, human services, across the — water quality, sewers, potholes. Our role has changed from the singular focus of civil rights, which is important, to be an expanded role that includes civil rights but everything else that we have to change. Mayors, especially African American mayors, need to be change agents — change agents for their city. I think all the mayors you mentioned are change agents for their cities — in every aspect of city life, not just in one or two. Every aspect. My favorite saying in this city, among my staff, is: the city that stays the same falls behind. Listen to the whole thing above or read the complete transcript for more. Yeah, NE Ohio is in the Rust Belt and it essentially gave Obama a second term. A lot of positive spin you’d expect from a mayor, but anything to say about the Koch brothers being able to come in and defeat a miniscule zoo levy? So Aaron, did he change your mind about a commuter tax for Indy? @Eric, you may have noticed he talked about recent levies that failed, and he understands why they did. You’ll note that although a Democrat, he did not rail against the Koch Brothers but rather is focused on taking care of business. @ Aaron Found a specific quote from him on the zoo issue below. Seemed to be somewhat of an inner city vs. outer city issue, something easier to overcome when those outer residents don’t have a say, like in nonconsolidated Cincinnati, which renewed zoo and library millages in a landslide last fall. Eric, I think there’s more going on than this. The Columbus Zoo is located in Delaware County and I don’t even think it’s inside the city limits. According to the Columbus Dispatch, the levy would not have been paid by Delaware residents. Makes sense to me that city residents would want regional skin in the game. Also, almost $33 million per year for a zoo is a lot of taxpayer money. The levy was going to double and be made permanent. Of course the center city residents would want it because almost $60 million of the money was going to build them a new satellite zoo downtown. The case for the zoo levy was far from a slam dunk. Based on what I know, I probably would have opposed it too. Columbus already has a first rate zoo and there are higher priority items to address. Having a 10 year renewable levy also keeps the zoo leadership accountable because they have to make the case to the taxpayer ever decade to renew their funds. @ Aaron Two Franklin Co. residents I know were surprised by AFP’s late blitz against the levy and that it failed like it did. Whether or not it would’ve passed, it says a lot about a place (also see Indy transit bill and Nashville BRT) when AFP can come in and basically shut down locals from pursuing something. As opposed to the normal situation like the sin tax levy in Cleveland, where local power broker cronies outspend citizen opponents by 10+ times? I would speculate that the pro side of the zoo levy was still better financed, and enjoyed more positive media coverage. Progressives need to take more accountability when their proposals fail and not just blame the Koch Brothers or Republicans when the voters reject them. I don’t see Coleman bemoaning the Koch Brothers. In any case, I don’t think one failed levy about a non-core function like a zoo says anything about Columbus. There are some interesting, subtly specific digs on Cleveland, losing population, and Cincinnati, increasing poverty, despite his claim that he has nothing negative to say about them. There’s also a similar tendency you see from Pittsburgh urbanists to distance themselves as much as possible from the Rust Belt, despite still having clear connections to it. Honda is still a major Columbus area employer, and historically, it has had a lot of manufacturing activity (Worthington, as a big historical example) along with the university trade. I’m not sure exactly why these cities feel stigmatized by the region, and who exactly they are trying to impress by asserting no connections whatsoever to their own geographies. I would think more benefit could be gained from asserting a leadership position within the region, rather than asserting that they are anomalies from it. It’s in Delaware County, but Franklin County funds it. I don’t think the Zoo board wanted to put it on Delaware County as well, because if I understand it right, each county that the ballot’s on has to approve it (maybe)? And why would Delaware County support a levy when they are basically getting a free zoo now? The tax increase would have been like $35 per $100,000 property value. Not huge. Still, I’ve seen several of these lately, where the community has always supported something in the past and didn’t this time. Last election it was the Mayor’s push for a big school levy to address multiple issues there (including the fall-out form a corruption scandal). Having said that, I think it’s ridiculous that ANY national PAC would get involved in a local election with NO national implications. @ Aaron and George Isn’t lobbying for or against something a targeted action? If AFP didn’t think the values of most voters in Columbus didn’t align with their values, they wouldn’t have even got involved. Columbus added about 60,000 jobs since April 2011 while Cincinnati added 50,000 according to the Bureau of Labor Statistics, http://www.bls.gov.eag. Where does this exceptionalist Columbus narrative come from? It’s doing relatively well, but it isn’t somehow in another league or class economically. It’s housing market is indistinguishable from Cincinnati, for example. Columbus is in the game, but it is not the unquestionable winner. The assumption that it is misleads workers, business owners, and politicians as they decided how to act economically. Cincinnati’s outpacing Columbus by about 30,000 jobs so far in 2014 according to the BLS’s monthly summaries, so I understand where Matthew’s coming from in not wanting to crown C-bus the clear jobs winner, but that dip in 2009 and 2010, not to mention the subsequent three years leaves a lot of ground to catch up. Here are the total number of jobs from the BLS website by MSA. Cincinnati, April 2011 – 991,00: April 2014 – 1,040,600. Columbus, April 2011 – 920,500: April 2014 – 983,400. Are these numbers not widely accepted? Are there other numbers to which people refer? Matt, the problem is that 1. 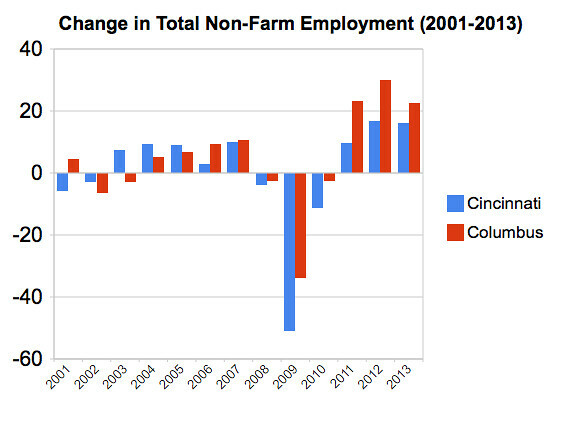 Cincinnati lost far more jobs during the recession than Columbus, and 2. Has yet to break even on those losses. Columbus broke even 2 years ago and is now significantly ahead of its pre-recession peak. So even if Cincinnati gained more, because it’s a larger metro to begin with, it’s not necessarily growing as fast, and it started at a much lower point than Columbus, anyway. Given all that, Columbus does have the better-performing economy. Cincinnati, however, does have unemployment below the national average, and in fact, all 3-Cs are in the top 5 of the best-performing metros this year. Jon, the “Columbus narrative” is that Columbus has surged ahead of other metros in recent years as a center of innovative economic growth. It’s understandably held onto the state and university jobs, but they aren’t evidence that Columbus is somehow a center of innovation and job creation that other metros can learn from. Columbus is a cheap and cheerful place for ‘near-sourcing’ of jobs from higher cost locations. All well and good, but not a model of how to move up the chain of economic value. Pittsburgh or even St. Louis have more to teach us about that than Columbus’ ‘we have that too…for less’ model. The deeper trough narrative starts out true, but gets into a bit of trouble when you reach the “Given all that, Columbus does have the better-performing economy,” statement, as the Columbus having the better economy in the present tense does not actually appear to be the case by many measures. It’s certainly true that Columbus had the better-performing economy between 2006 and 2013, and therefore in aggregate has the better performing economy between 2006 and 2014, but in terms of 2014 alone and which economy is performing better right now as we speak, it’s not true. I think this is a smaller quibble I had with Mayor Coleman’s statements too, in that he’s setting aside the actual picture of the present to instead point to one of a recent past, and a city can get in trouble if institutionally it gets too trapped in a rosier picture than what’s actually happening like that. I think something very much like this has just happened in Pittsburgh with the city seemingly coasting on the positive press and attention it’s gotten for its recovery even as the economy has been slowing to a crawl over the last six months. I don’t believe, however, in Mayor Coleman’s case that he’s actually living in that rosy picture instead of just hyping it as a good mayor should for PR purposes. Like I suspect with you, I actually don’t want to disrespect either city when both Cincinnati and Columbus are performing relatively well right now, I think both rather than just one succeeding at the same time is a great sign for the region. It reminds me of the people who inflate the importance of Indianapolis by touting it as the 12th largest city in the U.S. As if Indy or C-bus is actually as important as Boston, Seattle, D.C., San Fran, Denver, Minneapolis, etc. Other than that, I didn’t see any comments that made me cringe, so that’s pretty good. Jon, It’s not even true over the last several years. Every set of local elites has a narrative that it finds useful. Columbus’ narrative is not necessarily any more unsupported by the evidence than any other metro, but it isn’t any less so either. Columbus has state government and OSU. These provides a valuable economic stability. They are Columbus most important economic drivers. Columbus isn’t a special center of innovation or private sector economic dynamism, it’s simply in the game along with many other metros when it comes to private-sector jobs growth. That it what I see in the BLS job numbers. Columbus is not an example for more complex and larger metros such as Cleveland, Pittsburgh, Cincinnati, or St. Louis to follow. I may not be perceived as nice or diplomatic to point this out, I do believe that it is true. Columbus is indeed a center of innovation. Battelle is the world’s largest private scientific and technological research organization, for starters. Nationwide Children’s Hospital is among the ten largest centers of pediatric research in the country. There are many more. They aren’t household names. Like so much about this city, you just need to know where to look. Cincinnati Children’s is the number one center of pediatric research in the U.S. GE Aviation and Procter & Gamble give Cincinnati a vast research infrastructure. Columbus is NOT unique in this respect. That is evident in the job numbers I introduced. It would be useful to look at what kinds of jobs are being added in Columbus vs Cincinnati over the last 10 years. That would give us a better picture of the differences or similarities between the two cities. Stop the numbers game between Ohio cities and focus on our state’s incredible resources. California has 156,000 square miles and Ohio has 41,000 square miles. California has 38,000,000 people (it should it’s own country). Ohio has 11,500,000 people (we could be our own country). Ohio remains stable because of agriculture, manufacturing and education. California remains stable because of agriculture, manufacturing and education. I’m an old guy, so I was appalled when Nationwide made Children’s Hospital change its name to Nationwide Children’s Hospital after its $50,000,000 donation. In the old days (10 years ago) you gave a donation without expecting a return. It’s not a game. the numbers are evidence of what is and is not going on. we need to know. just saying, ‘we’re all the same’ blinds us to understanding important differences that are useful for all to understand. Matthew Hall your dismissive attitude pertaining to anything Columbus shines through once again. Your anti-Columbus rants on another forum are quite spectacular. Chris, you’re absolutely right. Columbus is so atomized, so frictionless that there is no reason to stay. If feels like a hotel instead of a apartment building. There is no there there. Is that part of its DNA from its origins as a planned government camp and college town much as trade and diversity are part of New York’s DNA? Anonymous, flattery will get you nowhere. Even Columbus isn’t dull enough to make my modest little observations “spectacular” by comparison. As Aaron wrote, this is an internal Columbus issue.